The ban on electronic devices larger than a standard smartphone from the aircraft cabin of passenger flights to the US and the UK is the latest security measure in the aviation world. The US and the UK government issued a directive to certain airlines mandating it for their passengers check in electronic devices excluding smartphones on flights from Turkey, North Africa and the Middle East. The ban has already come into effect. It will be fully effective from March 25, 2017. The United States was the first to undertake this security measure for inbound flights. The United Kingdom joined the bandwagon after a few hours of the announcement by the US government. The US ban on electronic devices other than smartphones from cabin or carry-on baggage on inbound flights from Abu Dhabi, Dubai, Doha, Istanbul, Amman, Cairo, Kuwait City, Casablanca, Riyadh and Jeddah applies to the airlines: Etihad Airways, Emirates Airlines, Qatar Airways, Turkish Airlines, Saudi Arabian Airlines, Royal Jordanian, Kuwait Airways, Royal Air Maroc, and EgyptAir. Notably, US airlines and outbound flights from US airports operated by the above-mentioned airlines are exempted from the ban on electronic devices like laptops, tablets, cameras and gaming devices as carry-on items in the cabin. The ban on electronic devices excluding smartphones from cabin baggage will mostly affect business travelers on international flights to USA and the UK. It has elicited a mixed response from air travelers who are required to check in their valuable electronic gadgets as part of checked baggage in compliance with the restriction. 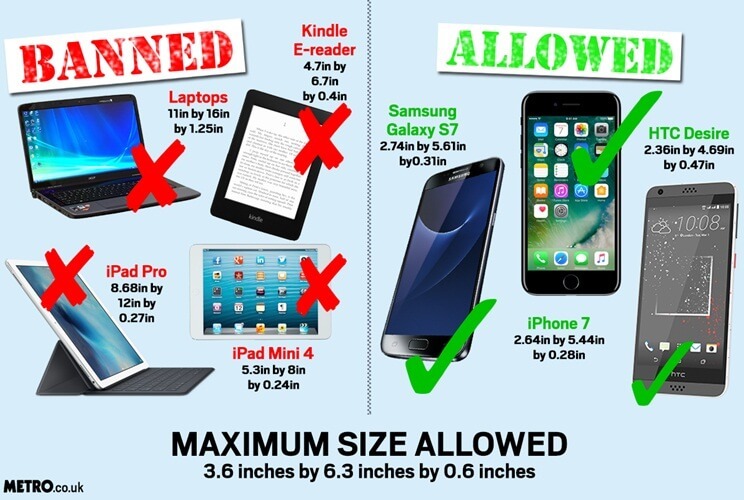 If the permissible weight limit of check-in baggage on flights by those airlines on the UK and USA ban list will be increased to include large electronic devices, is a question now. However, the ban is not imposed on medical devices in the aircraft cabin as of now. Travelers with medical devices as carry-on items, can board flights only after they go through fool-proof screening at the airports within the purview of the ban. iEagle Travel is a trusted travel organization for booking economy and business travel on cheap flights from US airports.